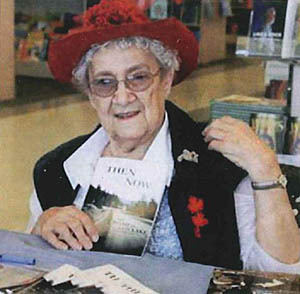 Kamloops author, Mona Saemerow, has always written from her own extensive experience. Mona is a creative artist, as well as a writer. Her family roots are deep in British Columbia and she has a thorough knowledge of the province’s history. She is also a keen observer of the natural world which she describes with detailed understanding. Mona’s books, set in the Kamloops and Cariboo regions, describe the transition from pioneer times to the present. They are also her family histories, since her relatives were among the early settlers in British Columbia. In fact, British Columbia didn’t exist in 1858 when Mona’s maternal great-grandfather, Alexander Hardie, left Sacramento, California, lured by rumours of gold in the Cariboo. According to family lore, he joined Major Mortimer Robertson’s group of two hundred and fifty five American miners headed north. In late August 1858, when this heavily-armed troop of men, supported by four hundred horses and mules, marched through the Okanagan, and Kamloops on their way to the gold fields, they were traversing New Caledonia, a territory of the Hudson’s Bay Company. Not until November of 1858 was the Crown Colony of British Columbia formed, partially in response to the influx of American miners. Newman Squires, Mona’s other maternal great-grandfather, who was born in Kentucky in 1830, came to B.C. with the Harper brothers in the 1860s. He was top drover for the Harpers on their beef and horse drives, and became foreman on their Gang Ranch in the Chilcotin. His daughter, Christine, born in 1867, was Mona’s grandmother. Christine’s own mother Lottie Kwal’atkwa, a Shuswap woman, died when Christine was very young. Raised on a Reserve in Clinton, by an elder brother of her mother’s, Christine was taught the traditional skills and legends of the Shuswap people who had lived on that land for thousands of years. Mona’s father’s family, the Chesters, were equally adventuresome. Her great-grandfather Chester worked as a miner in Utah, Nevada and Arizona before coming to Canada in 1916. He, his wife, and their two sons homesteaded in the Red Lake area in 1917. Getting to the homestead meant taking the CN Railroad to Copper Creek, then traveling up the mountain by horse and buggy. Mona’s father Bert Chester was only seventeen when he filed on his homestead. As a young girl growing up on the homestead Mona learned such basic western skills as roping calves for branding, or chasing and capturing wild horses. She dreamed of being a cowboy’s sweetheart. That dream came true when she married Melvine Saemerow, who was, himself, from a pioneer family. Mel got a job as ranch manager for the Devick family’s Klondike ranch, and Mel and Mona moved there. Columbia” and “Memorable Moments In The Bush” , both published in 2010. In her prologue Mona notes, “The road has improved and changed……The rocks and hills remain the same.” Following Mona’s instructions means staying alert for great blue herons, kingfishers, and osprey or for otters playing in a meadow submerged by spring’s high water. That same meadow when dry provides summer hay and grazing for cattle in early autumn. The book mentions mining claims once worked, and notes good spots for hunting and fishing. Those braving the road are rewarded by sights and sounds of nature and an appreciation of the determination of those who traveled and settled there. she was no different than hundreds of other women.” Mona’s biography of Christine highlights the often ignored contributions of Indian women whose strength and spirit inspired their partners and their children. Their influence stretched from the B.C. Governor-General’s mansion to obscure cabins, yet they seem to be missing from history. Whether, as a young bride, catching wild horses for sale; searching for gold dust in Barkerville, helping husband Tom Hardie run their ranch at the foot of Hardie Mountain or establishing a boarding house when circumstances changed, Christine was a determined, courageous person, an inspiration and support to her children and grandchildren. By telling Christine’s story Mona has made her an inspiration to many others. Memorable Moments In The Bush, Mona’s latest book, provides amusing anecdotes of her times in the outdoors with friends and family. She knows, and tells, exactly when calypso orchids bloom or ducks return. Stories include her fishing and hunting experiences and occasional unexpected encounters with wild animals. Nature is necessary to her. Even when they lived in New Westminster, Mona and her family came home “to the bush” as often as possible. Her recollections of strolling around a lake, enjoying a fire, watching the sunrise, hearing loons calling, huddling with friends under a tarp on a rainy day singing in spite of the damp, will create nostalgia in anyone who’s ever camped. Those who haven’t may be inspired to buy a tent and a tarp and give it a try. When it comes to writing and publishing, Mona’s done it her way, with the expert help of Kamloops Sure Copy Centre. She’s done her own editing, designed the attractive covers and layouts of her self-published books, and promoted her work. To Mona writing is communicating. Research, design and promotion aid in communication. Having written a travelogue, a biography and a memoir in four years; Mona’s now working on her fourth book, “One Little Pocket”, her recollections of life in Red Lake and how it affected her. As she puts it, “It’s one little pocket in B.C. It’s also one little pocket in time.” Mona lives very much in the present but the past is still alive to her. Anyone who cares about history, particularly the history of the Canadian West, will be grateful for Mona’s meticulous research and spirited writing. Her well chosen words bring the past close and remind us to look for and enjoy the natural beauty around us.